Congratulations, you've made it through Christmas and managed to keep your poinsettia(s) alive! As Chris mentioned last week, poinsettias are the most popular potted plant in the U.S. If you're anything like me you have a hard time throwing perfectly (and sometimes not so perfect) good plants away. Alas, most people dispose of poinsettias after they finish blooming, but with a little effort, you can get your poinsettia to bloom again for years to come. If properly cared for, poinsettias can retain their color for several months, but as the saying goes, all good things must come to an end. Once about half of the leaves and "flowers" have dropped, start to decrease watering until the soil is completely dry. This will cause the plant to go dormant. Then store it in a cool, dark location, watering only enough to prevent the stems from shriveling. Once new growth begins, usually in early May, cut the plant to within 4 to 6 inches of the soil; this will help encourage new growth. If you wish to repot the plant, now is the time to do that as well. Place the plant in a sunny window and treat it like any other houseplant, watering when dry and fertilizing occasionally with a dilute fertilizer. Once the danger of frost has passed and nighttime temperatures remain above 50° F, move your poinsettia outdoors, exposing it to direct sun gradually over a week or two to allow it to acclimate to the outdoors. Eventually, place it in an area receives 6 to 8 hours of direct sunlight, with some shade in the afternoon. You can either sink the pot into the ground or leave it above (remember, pots above ground may need water more frequently). To keep your poinsettia from getting too leggy, pinch off the shoot tips, choosing tips with two or three fully expanded leaves below them. Do this every three or four weeks until mid-August to keep the plant compact and bushy. 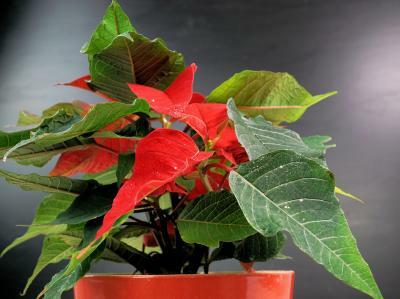 Remember to water your poinsettia regularly, and fertilize it every couple of weeks. Just like our other houseplants, when night temperatures get down to 55 to 60° F, it's time to bring your poinsettia back inside and place it in a sunny window. Poinsettias are short-day plants, meaning they grow vegetatively during times where there are long days and produce flowers when exposed to short days – or, more specifically, to long nights. For your plant to rebloom in time for Christmas, it needs to be in complete darkness from 5 pm to 8 am from about the end of September until the bracts develop good color, usually in early or mid-December. To provide darkness, place the plant in a closet or cover it with a box. During the day, put it back in the sunny window. Keep up this routine until the bracts are almost fully expanded. Try to make sure the plant doesn't experience temperatures below 60 or above 70° F. Nighttime temperatures above 70 to 75° F may delay or prevent flowering. With a little attention, you can keep yours going for years to come. Good Growing Fact of the Week: The large colored parts commonly thought to be the "flowers" of poinsettias are actually modified leaves called bracts. The greenish-yellow flowers (cyathia) are clustered at the center of the bracts.